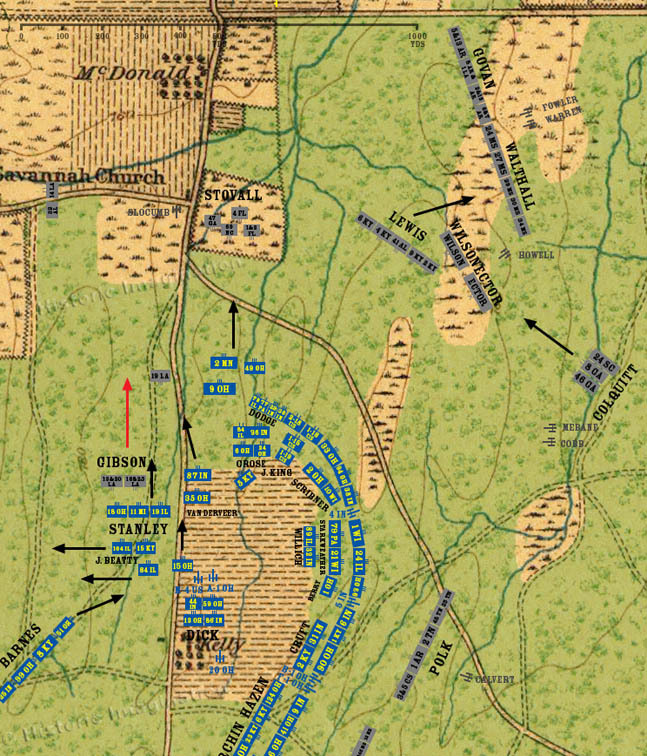 Stanley’s brigade charges Gibson, and with Van Derveer’s brigade outflanking them, Gibson’s brigade retreats from the woods west of Kelly Field. The two regiments of Beatty’s brigade and six companies of the 84th Illinois separated from Grose’s brigade drift westward toward the Snodgrass cabin. The 15th Ohio of Willich's brigade moves north to link up with the 49th Ohio. In the woods east of the McDonald farm the Confederate Reserve Corps has assembled. Major General W.H.T. Walker, its commander, wants to send the entire corps (really just a division) to Breckinridge’s support. Lieutenant General D.H. Hill disagrees, and an argument ensues. Colonel Lewis withdraws his brigade behind the Reserve Corps after re-uniting the two wings.